"eNO". 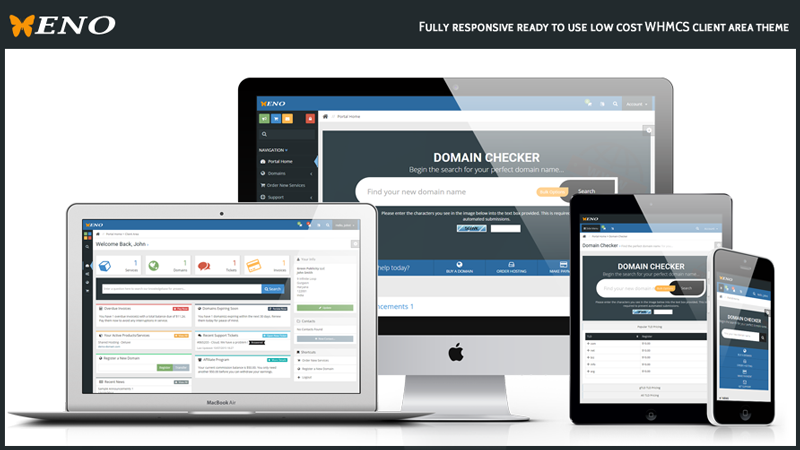 This is a very beautiful, fully featured and attractive theme which is designed specially for the users who do not want to disturb their main website, and want to offer a rich experience to their customers to manage their tasks smoothly from their gadgets. Custom top menu (hide by default). 2 Colors sidebar (Light and Dark). Mobile friendly WHMCS theme based on Bootstrap 3 framework. Free 1st year support and updates. Supported with Latest WHMCS 6.1.x or Later. Compatibility: Firefox, IE9+, Chrome, Opera, Safari and all latest browse. Beautiful theme by Theme metro. One of the best values, in terms of WHMCS themes. Offers a very professional client area experience for your users. Recommended! Perfect, congratulations for the theme. Very good. Upgraded for WHMCS 7.0.1 and improved eno-tables order form for better layout and fixed some bugs. Bug fixed - Google reCAPTCHA is not showing in mobile devices for domain search.